My sugar coated life...: Non-edible cupcakes?! This post if a little off topic but I thought I'd share a fun time I recently had a friends party in Nottingham. My friend Beth rather ingeniously hired out a fun sewing class at the Textile Workshop in Nottingham so the 10 of us could have 3hrs of fun making and altering some of our favourite clothes. Now, let's get this straight. 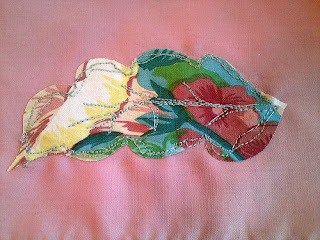 I was worried as we sat down to start the lesson as the prospect of using a sewing machine terrifies me but the teacher (Sarah) was great and after taking a few other classes at the Workshop I knew it was going to be a relaxed and fun atmosphere. 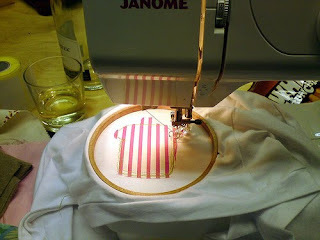 The evening didn't disappoint and I really enjoyed my first attempt at applique! It had to be cupcake themed and I made a little addition to a plain white t-shirt as well as a little floral leaf that I am hoping to add to another shirt I have languishing in the wardrobe.